It is a known fact I have a love-thing for peanut butter. Add chocolate to the mix and you have me hooked. 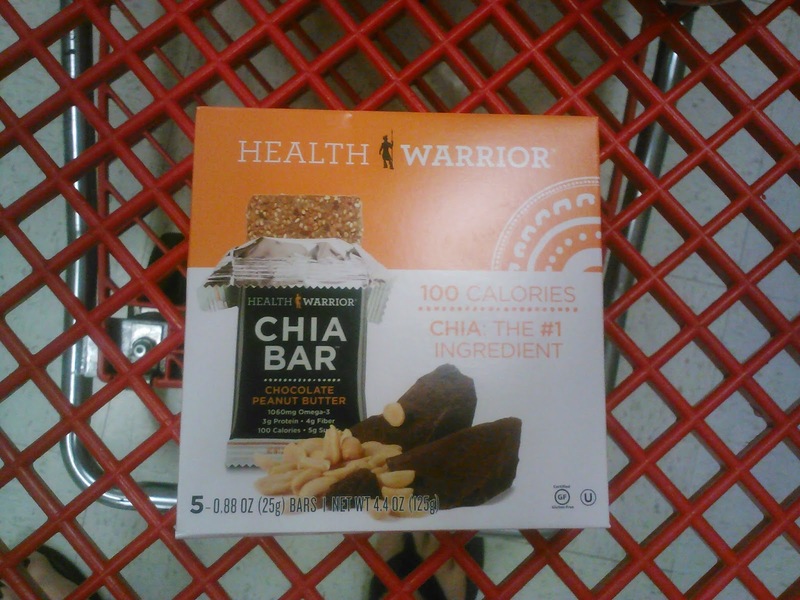 So when I spotted the Health Warrior Chia Bars in Peanut Butter Chocolate I scooped up a pack. Last week I spotted them on sale, my fave flavor combo was sold out but having to go back a few days later they restocked them and I got a box! On sale at under $5 a box, each bar comes to under a $1 each. Full of chia seeds, a kick of peanut butter and chocolate flavor and perfect snack size these are a winner. The bars are small making them a quick munch on a break or with a cup of coffee when you need a pick me up. They are only 100 calorires if you happen to be watching your calorie intake making them a safe snack bet. They fit perfectly in a lunch bag or your gym bag. Target has a few flavors and this is not something I have found at all the Target stores I have visited yet. They are in the granola bar section and not the workout/protein bar section if you are looking to pick up a box. I didn't dig the apple cinnamon, but the COFFEE ONES. Yums. i have not seen the coffee! i am looking for them! Love the sound of these and only 100 cals - though that would tempt me to eat two! These things are amazing! They didn't sell too well at my old job, but I really liked them. I think the seeds in the teeth is a major factor in why people do not dig on them.